Saturday lunch, fresh from the oven. Why is it, that when you have almost no ingredients on hand, you get the best meals? Saku and I, being just the two of us in Italy, are able to go days without visiting a grocery store, and still eat delicious things. Having a garden helps, as well as always having grains, pasta, good oil, eggs and cheese on hand. Still, I find that the emptier the fridge gets, the more creative you are, but you also begin appreciating each ingredient more, and going for simpler combinations. For example, take two ripe tomatoes, wash them and chop them, add fresh basil leaves, olive oil, and a little bit of salt and pepper. Yes, this is how good tomato tastes. And yes, this is a gourmet salad that lacks nothing. 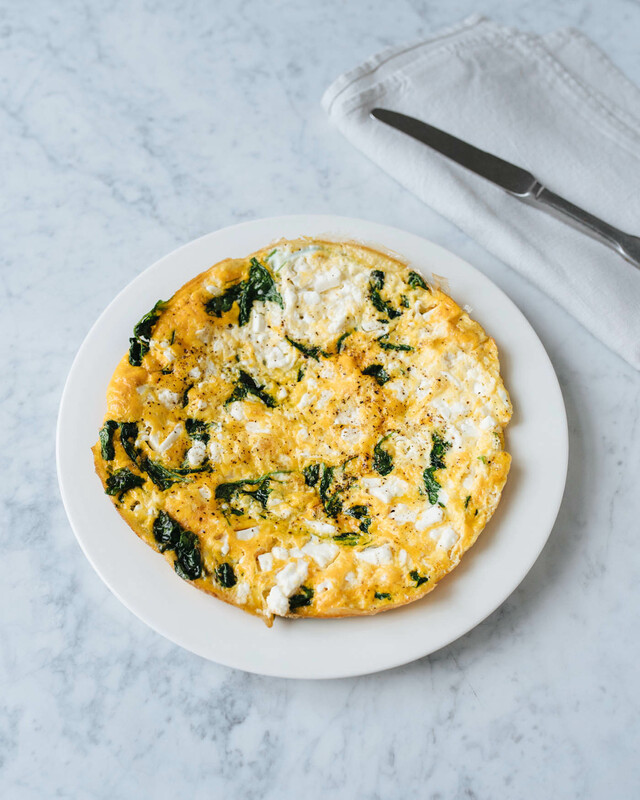 My go-to quick meal is frittata, a round omelet that you can make from scratch or using leftovers from last night’s meal. Frittata is warm and filling and delicious even if you make it with little more than eggs. That said, having an onion for the base is wonderful. Onion is one of the so-called aromatic vegetables that provide an essential background flavor to countless dishes, frittata included. And you can also make your frittata dense in filling. Then it is almost like a pie without a crust. In summer, my favorite filling is zucchini, peas and mint, with or without feta cheese. For this recipe I used spinach and feta, because that is what I had on hand. The simplest method for making a frittata is to beat eggs in a separate jar and season with salt and pepper, then cook the filling (excluding cheese) and pour the eggs over the filling into the pan. While some recipes advise you to turn the frittata over on the pan, I prefer cooking the top in the oven. Choosing the highest possible temperature, preheat the grill element in your oven. Beat eggs lightly and season with salt and pepper. In a oven-proof pan, heat a tablespoon of olive oil, add chopped onion and spinach leaves, and cook until onion is translucent, for about five minutes. Pour over the egg mix, stir to combine, sprinkle feta evenly over the pan and cook undisturbed until the edges are set, for about two minutes. The bottom and edges of your frittata are now cooked but the surface appears mostly liquid. Transfer pan to oven and bake under the grill element some two, three minutes. You want the eggs to be cooked evenly but the surface not to burn.